A scene from The Taming of the Shrew. BOTTOM LINE: A talented and enthusiastic company brings the comedy in Shakespeare’s controversial play but leaves the interpreting of the battle of the sexes up to the audience. I’m a somewhat reluctant Shakespeare fan, having resisted reading or seeing any of his plays (save for the required Romeo and Juliet) until college. My exposure to The Taming of the Shrew, in particular, was, like with many modern theatergoers, limited to pop culture: a 1980s episode of "Moonlighting," the movie 10 Things I Hate About You and Cole Porter’s musical Kiss Me Kate. Shakespeare’s original comes with a long history of debate about whether Shrew is sexist and patriarchal in its depiction of the male-female power dynamic. According to director Thomas G. Waites in the program, it’s seldom performed, perhaps owing to the controversy. Waites opts to open with a framing device, the rarely-staged Induction (more on this later), in which a nobleman and his friends come upon the drunken Christopher Sly (Joshua Walter), pranking him into believing that he is a Lord with the play being performed for his amusement. The story concerns Baptista (Alexandra Montgomery), a wealthy nobleman with two daughters to marry off with hefty dowries. His youngest, Bianca (Jennifer Kalajian), has numerous suitors, but he won’t allow her to marry until his eldest, Katherine (Elissa Klie), possessed of a fearsome tongue and oft-used fists, has been matched. Petruchio (Michael Moss), whose father was a friend of Baptista, fits the bill. He wants a wife and comes with assets. The two men make the arrangements (Katherine has no say) and once married, Petruchio sets about reforming her sharp tongue and fiery demeanor. Bianca, meanwhile, subjected to the machinations, disguises and scheming between a half dozen men, falls in love and elopes. As for the text, the director refers to Shakespeare’s perceived harsh treatment of the female characters as “the elephant in the room.” Many versions of the play, whether on the page or stage, don’t include the Induction. Some Shakespeare scholars and feminists have argued that the Bard’s use of the scene indicates his intention to have the men’s bad behaviour seen as farcical and not to be taken at face value. Waites would seem to be making the same case beginning the show as he does. His pro-woman sentiments are further evidenced by his casting as he has women playing Baptista and Petruchio’s servant Gremio (Illaria Malvezzi). The large cast ably handles the comedy along with all of the switched identities. Some of the standouts include Elissa Klie who is a game Katherine, taking a swing at her sister, sparring with the men and making her rage at being treated like chattel deeply felt. 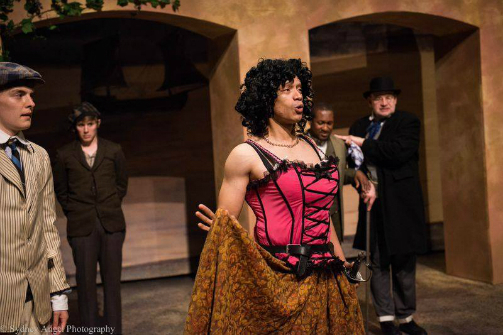 Michael Moss as Petruchio skillfully navigates between charm and loutishness. Jakob Minevich’s shoeless Biondello the trumpet player was a bit hit with the audience, no doubt in part to his rapping skills in the wedding scene. Malvezzi, a professional dancer, was particularly impressive in a part that called for comedy as well as physicality with many falls and being boxed about by Petruchio. The show was enhanced by the presence of two musicians on stage (Dan McCarthy on viola and Alexandrina Boyanova on violin) who supplied accompaniment and comedic sound effects. Shakespeare’s intentions in Taming of the Shrew will no doubt be debated for centuries to come. But with this production, Waites and company deliver a spirited and fun romp.